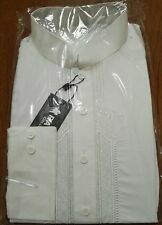 Men's Indian/Asian cream Kurta pajama. A classic and simple Kurta pajama. Kurta length is 116cm. This it is cotton. Pretty embroidery around the neck with detachable (cream and gold) dress buttons. These are all my husbands, he has lost a lot of weight. Indian mens kurta. Condition is New with tags. Dispatched with Royal Mail 2nd Class. Pakistani Indian/Asian Men's Wedding/Party Suit Kurta, Pajama Grey. This was worn once for a wedding. Length 45 inch Chest 46 inch Sleeves 26 inch Shoulder 19 inch Comes from a clean and pet free home If you have any question please message me Thanks. 5XL XXXXXL TOP KURTA PANJABI SHIRT BLACK INDIAN MENS. Top very large quite short also selling long separately 35 in pit-pit approx worn so may show some signs of use Dispatched with Royal Mail 1st Class. Jacket WIDTH underarm, 22. It has CONCEALED BUTTON and HOOK fastenings and 2 side POCKETS. I will answer ASAP. Kurta top is red with gold detailing all over (back and front) and round gold buttons all the way down. A stitched-in pocket square in gold and red is also on the left chest of the kurta top.